This is a Hawaiian Style apartment located on Kailua Beach, one of Hawaii's most beautiful of white sand beaches. Kailua Beach has been rated tops among USA's best beaches. The apartment is located in the back portion of a beachfront home with its own private entrance and has convenient parking on driveway just outside the rental unit. The bedroom has one king-size bed and over head ceiling fans for extra ventilation an comfort. The sitting room includes a futon couch-bed and futon lounge chair with leg rest, room accordion sliding divider door, and second ceiling fan. There are floor to ceiling louver windows for cool breeze flow. The unit also has a large study desk/ table, TV with cable, and unit is computer “WIFI” wireless ready. The kitchenette is fully equipped with a microwave, large sink, Kreuig coffeemaker, refrigerator with freezer, hot plate, toaster, saute pans, dishes, and utensils. There is a connecting private bathroom and shower supplied with bath towels sets an beach towels. Rental has direct side walk private access to front lawn sitting area where tenants can relax an enjoy the spectacular panoramic view of Kailua Bay and Mokulua Twin Islands with steps just at the yards corner to beach. Lounge & beach chairs and boogie boards are included for use at rental premise only. There are out side hose's and faucets for rinsing after going to beach and swimming. There are convenient clothes lines right outside rental door for drying suits, towels, an clothes. All rented bikes, surfboards, or any large heavy equipment you may have, can be stored just outside rental. Before storing large, heavy valuables inside, "please consult us first" to safely accommodate your needs. We only accept ages 20 years an older. Rates are based on 1-2 people. During Christmas & New Year holiday periods - 3 weeks before 12/25, and 1 week after 12/31, we have a 6 day minimum booking, including the holiday. All reservations are booked on a “first come basis”. All credit fees of 3% are paid by traveler. We kindly ask our tenants to please keep entertaining guests to a “minimal", and out side on front lawn, or the beach. Visiting children need to be accompanied by an adult. The rental facility is strictly for our tenants use only. NO animals are allowed on premise. There is 'NO Smoking' permitted in rental premise. Beach towels, bath/hand towels, and wash cloths provided. Beach is seconds from rental unit. Tenants have full use of front yard which has panoramic view of Kailua Bay. Rental is located in back portion of home located "beach front" on Kailua Bay. Free parking available on premise driveway just out side rental. Provided: Hot plate, sauté & sauce pans, blender, rice maker. Full use of protected front lawn to relax, just steps to beach with lawn and beach chairs WE KINDLY ASK TO BE KEPT AT BEACH RENTAL RESIDENCE. boogie boards for tenants use - WE KINDLY ASK TO BE KEPT AT BEACH RENTAL RESIDENCE. Computer Wireless Network, Cooking Utensils/plate wear, Bed Linens, Beach Towels included, beach chairs. Tenants provide their own personal bath soaps/toiletries. We kindly ask our tenants to keep their visiting guests “minimal". NO parties or entertaining on rental premise. Rental unit is strictly for tenants use only. Owners were great, very kind and helpful. Apartment was comfortable and clean. Great beach access! Great location and host. Shari was accessible and had lots of good ideas for things to do. She was super nice, easy going. We could easily tell she cared about our experience. Her property is right on the beach and a mile or so from all the restaurants and shopping. Would for sure stay again. It was so nice to have gotten acquainted with you both Paul! taste of old Hawaii an way to top of a vacation! stay with us! Hope to see you again sometime soon! Right on the beach in the widest, most flat part of Kailua bay, this property is in an amazing location. Steps to the beach, inside a very well-maintained property on a private lane. 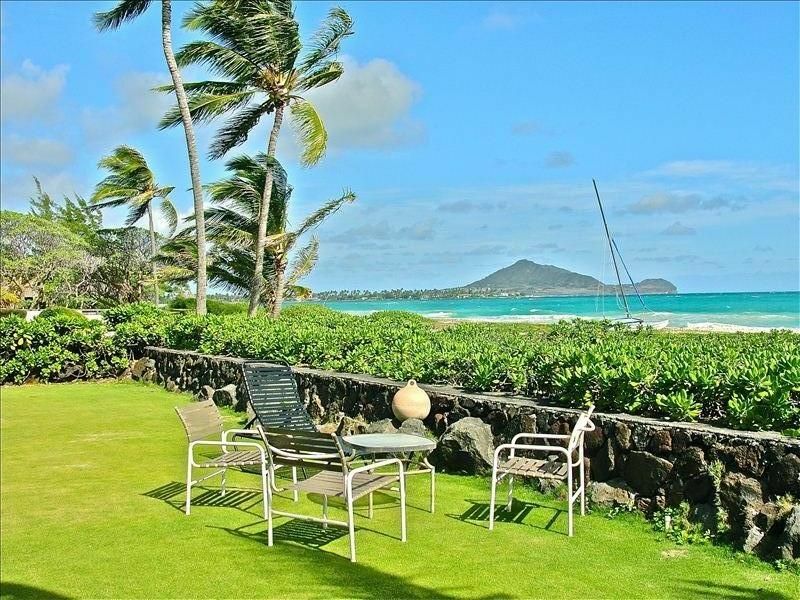 A perfect choice for a beach vacation in Kailua! We don’t know which was better, the property or the host. Shari and her father Herb we’re wonderful hosts to a beautiful property located on Kailua beach. Everything needed is there at the property. Shari was very attentive and communicated she would provide anything we may have needed if possible. Shari, Mahalo for a wonderful visit. Geoff & Lisa ... We're so glad you both enjoyed your stay with us in Kailua! Hope you saw some good surf on your visit to the North shore! The surf has been remarkable all week with the big north swell. Unbeatable location and very comfy and spacious apartment. We love this location on Kailua Beach and the apartment is quite spacious and well equipped with everything we needed to have a wonderful, relaxing vacation. It's literally on the beach and has a feeling of a tropical home away from home. As usual our host Shari was there with flowers and a welcome drink. The apartment has been beautifully updated with continued improvements and always sparkling clean. Thank you for being a wonderful host Shari...we will be back soon! soon for your return to stay in "The room with a view".. nothing like waking to the blue ocean an am looking foreword to opening it! Have a wonderful healthy year!! We enjoyed our stay immensely. Shari is a great host. We had everything we needed for a wonderful stay. The unit is clean and a good size for a couple. The kitchen was a good size fir us. Beach gear was available and in good shape. We’ll be back! experience some of the best weather we get! It was a pleasure to get to know you! We hope to have you visit again on another visit to Hawaii!